In its system called UltraFlex, Sydney-based company Ecoult has been commercialising a new lead acid battery that was developed by a consortium with the CSIRO. The UltraBattery is a hybrid, long-life lead-acid energy storage device containing both an ultracapacitor and a lead-acid battery in a common electrolyte. The Australian invention was built by Furukawa Battery Company in Japan and tested in the United Kingdom through American based Advanced Lead-Acid Battery Consortium. Now, Ecoult, which has powered its products with the UltraBattery, has been selected by German specialist in renewable systems and power converter manufacturer, Freqcon, to provide battery storage for its Tallaght Smart Grid Testbed, which is operated by MEGA, the Irish Micro Electricity Generation Association. “The market for grid-tied energy storage systems is growing, and fast frequency response is a valuable system service to the grid. Ecoult`s hybrid lead-acid UltraBattery is a very promising technology in this space and we are excited to partner with Ecoult and deploy the first unit in Europe,“ said Norbert Hennchen, CEO of Freqcon. Ecoult pioneered its hybrid lead-acid UltraBattery as a leading technology for fast-cycling, high-rate, partial state of charge functions in the US. 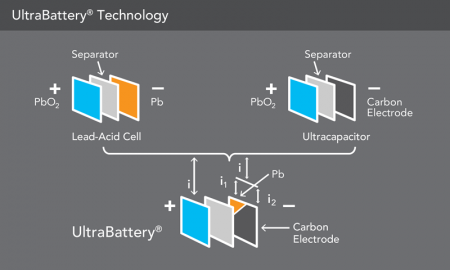 “The UltraBattery is a hybrid technology,” Ecoult CEO John Wood explained.